The ECOSOC Youth Forum, which was launched in 2012, provides an annual platform for youth to engage in dialogue with Member States on a range of issues of interest to them. The two-day event features brainstorming sessions, interactive speaker panels and discussions with Member States, providing youth representatives with an opportunity to voice their opinions, share ideas, and think together about specific issues of relevance to youth as well as the broader role of young women and men in enabling and promoting sustainable development. Past Youth Fora have discussed youth employment, science, technology and innovation and the post 2015 development agenda. Regional and global level Youth Fora have also fed into the ECOSOC Youth Forum. The ECOSOC Youth Forum brings young leaders from around the world to the UN Headquarters in New York. It is a platform for youth to engage in dialogue with Member States and contribute to policy formulation on economic and social aspects. Young people and representatives from youth-led organisations and youth-focused organisations are invited to attend the annual Youth Forum. 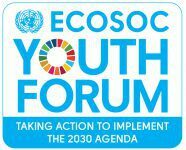 The next ECOSOC Youth Forum is likely to take place in early 2017.